“In general, it's a silent killer because you don't really know you have it,” hepatitis C patient Duncan MacInnes. “At that time they didn't treat hepatitis C because they didn't have a handle on it,” he said. That has changed and health officials are urging diagnoses because there is a cure. “Nowadays, hepatitis C is easily treated with one pill, once a day for eight to 24 weeks,” said Andrea Keller, a physician's assistant from MedStar Georgetown Transplant Institute who has treated Duncan. “In Duncan's case, he was one of our very first rounds, he was treated with DAAs, which are direct acting antivirals, where he needed two pills once a day for a period of 24 weeks,” Keller said. In 2013, MacInnes was free of hepatitis C after many years of unsuccessful treatment. “Hep C used to be a death sentence for people when they were first diagnosed, similar to HIV when it was initially diagnosed, but now with new treatments and companies continuing to create new treatments, people are surviving much longer,” Keller. 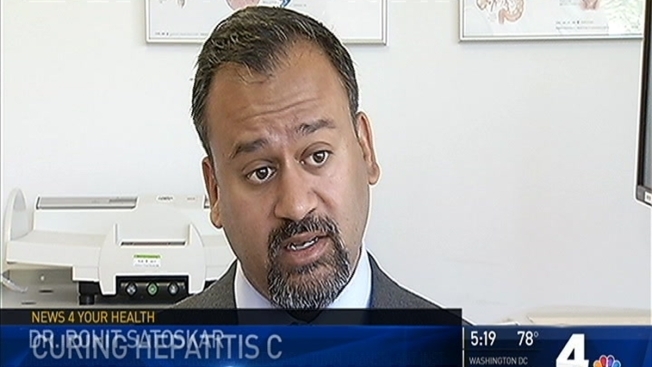 With cases of hepatitis C being cured, the rate of liver transplants due to hepatitis C is going down and the liver disease concerning doctors is fatty liver disease, according to Dr. Rohit Satoskar of MedStar Georgetown. Obesity is a leading cause. Satoskar said he believes up to 30 percent of the population has fatty liver disease. Blood tests can help, and a FibroScan can test for liver damage and also for fatty liver disease, bypassing the need for a biopsy.